it gives a "windows can't open this file"
So I cannot open my own files and neither can others if I send it to them. I would appreciate help because I am trying to send a part out for machining. That's just your Windows file associations. I don't have Creo 2.0 otherwise I'd upload the correct settings. 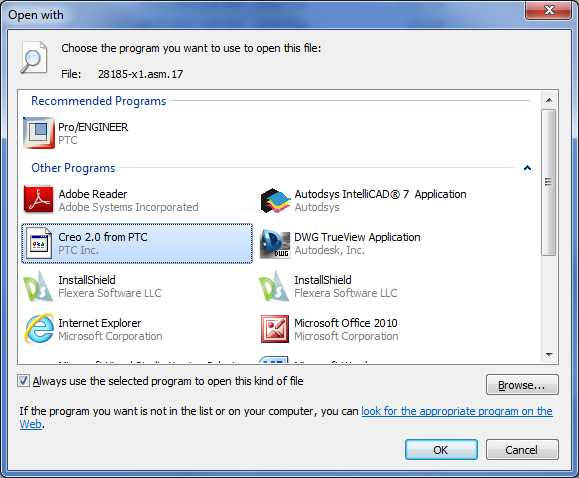 The simple solution is to right click on the file > open with > Creo 2.0 (check the box, "always use this program"). Post again if that doesn't solve it and we'll look at Windows file associations in detail. Creo associates itself with files with extensions from .1 to .250+, but it's usually only the .1 files that become disassociated. There's more though, because if you're opening files in this way then you have to be aware of your Creo sessions. If you open a file from Windows Explorer with the wrong command, you'll get it opening in a separate session of Creo - something that you probably don't want. Remember that you can drag files from Windows Explorer onto you Creo session in order to open them. Of course, fixing this on your computer won't help the person you're sending the file to. I would simply ask them to use the file > open command in Creo. Something you'd hope they could figure out. Remember to use a short file name and omit any spaces or special characters. I prefer to send exported files as it is software agnostic and prevents any errors that might occur as a result of regeneration (due to missing references etc). We have just upgraded from Wildfire 5.0 to Creo 2.0 M050 and file associations seem to be broken, we didn't uninstall wildfire 5.0 first and i'm wondering if this has caused the problem? all the instance files come up with a non Creo2.0 icon as though they are broken?? I have trawled google and can't seem to find a way to transfer all the file associations from ProE to Creo. I'm guessing we need to uninstall everything and install Creo fresh? proeFile="D:\PTC\Creo Elements\Pro5.0\bin\proe.exe" %1 (%1 is used to pass name of file being opened/clicked). I assume ProE WF5 is still used for file association. This way, whenever you click a ProE/Creo file in Windows Explorer, it will be open in Creo Parametric. it will work for all file extensions referencing proeFile token. If you'd like to know what "token" is used for file association, type assoc .1 (ProE file extension) in command line and you'll get a token name you need for ftype command. Cool thanks for that info, I managed to get over the line with a combination of this and some registry editing.